It’s a boy! 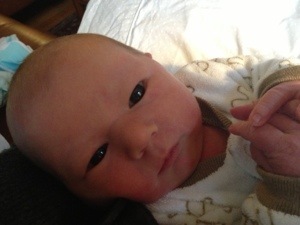 We are delighted to announce the arrival of our sweet son, Frederick David on January 15, 2013. Frederick (aka Fred, Freddy) is doing great. Born around 2 pm and weighed 8 lbs, 5 oz, 20 inches in length. He is perfect in every way. I am exhausted, sore and completely overwhelmed but totally in love. Who knew something so small could completely annihilate your life (in a good way!)? BB is adjusting well and loving fatherhood. He is waiting on me hand and foot and now that we are released from the hospital, he is very, very happy. He was not a fan of those nurses and doctors telling him what to do. Also, wi-fi at the hospital was terrible, thus adding insult to injury. 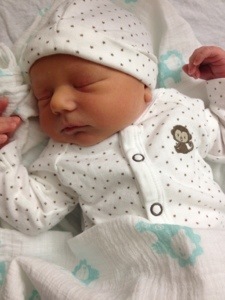 I’m looking forward to sharing his birth story when I am not limited to typing on my phone while he eats. For now, I will leave you with one more photo. I think in this one, he is begging for someone to save him from his incompetent parents. I don’t have much to update today, but I hope to later this week! Baby’s coming soon, Lord willing. I was honored a couple weeks ago that my blog was mentioned by PEAR (Parents for Ethical Adoption Reform) in a post about ethics in DRC adoptions. PEAR is a non-profit org that seeks to provide resources and information to prospective adoptive parents, specifically in the arena of ethics. I have found their website really helpful and necessary as we try and navigate the process. Check it out! My blog post on Adoption Agency Accountability was also mentioned by The Adopted Ones Blog last week. So fun! It’s a great blog from an adoptee’s perspective. Finally, I recommend you read Family Hope Love if you are passionate about caring for orphans and widows. Sara is writing a book geared toward international adoption reform as a parent who has walked the journey. She wrote a very convicting post that, I think, really highlights the role we are prospective parents play in encouraging further corruption. It’s a tough read, but worth it. One of my favorite months of the Seven fast was the media fast. It was hard. I am pretty addicted to media – tv, music, blogs, Facebook. I don’t like to think that I am. I like to think that I a purist and above getting sucked into media, but it’s all false. It was a great experience to detox and have to quiet my mind and thoughts. Our pastor gave us a challenge this week to detox from media for three days this week, and I’m excited to accept it! I really need this right now. Since I’ve been away from work, I spend a lot more time on the internet and watch a lot more tv. With Baby Bean’s coming arrival and a few other decisions about the upcoming year on the horizon, a fast is absolutely right for me. I need to hear from God right now. I need the quiet of my mind so that He can speak to me and prepare my heart for this transition. I’ll be back on Thursday! In what can only be described as a perfect ending to 2012, I spent most of Monday with severe back pain and contractions believing I was in labor only for it to stop abruptly with no baby. Screw you 2012. The feeling is mutual. I kid, of course. 2012 wasn’t “the year we were introduced to the show 24 (2005)” good, but it wasn’t all bad. We spent a lot of time reminiscing about 2012 – the highs and the lows. You all know the lows all too well, but here are some good moments of God’s blessing and provision (and some good clean fun!). We spent an amazing week in TN, AL and MS learning about Civil Rights history and eating BBQ. I turned 30 and celebrated with a lovely dinner with friends. So many friends had babies that I love to snuggle. And lots of friends brought their children home through adoption. We went to a fantastic couple’s retreat in Lake Geneva that ended with a dance party. Baby Bean (previously known by us as Spec and Blueberry) entered our lives and wreaked very little havoc allowing me to ignore him/her for the first 5 months of his/her life. We had a visit from our awesome friends, Charles and Amelia! BB sang in a bunch of great concerts and operas. We had a fabulous trip to Paris after a safe and eye-opening trip to DRC. My sweet friends through me a beautiful adoption shower, and out-of-town family visited us. I had the privilege of walking through difficult adoptions with other friends and providing a listening ear. Our friends Tommy and Tracey got married! We had a great Thanksgiving with BB’s entire family – the first time we were all together in 5 years. And of course, we were blessed with good health, a safe place to live, loving families, good jobs, and many opportunities to show God’s love to others. Not so bad after all. I definitely feel like I was stretched in 2012. My faith took a beating but came out stronger in the end, and I experienced more spiritual growth than I ever have. So much of 2012 was defined by the fast. It makes sense then that 2012 would be difficult. Fasting isn’t supposed to be easy. When we were going through the memories of 2012, we kept marveling at how crazy it was and how absolutely stressed out we were throughout the year. We wondered if we could ever do it again. While I would like to say that I want to seek out a more casual, comfortable life to avoid the drama that 2012 brought, I would be lying. Bring it on 2013. Let’s see what you got. I’m ready to get back in the game.